House flipping can be a very lucrative investment, potentially tens of thousands of dollars can be made in a short amount of time. Not only that, but the investor uses other people money in the form of loans to get started. There are a few basic pointers any house flipper should follow if they want to be successful. Once they get the hang of it, it will almost certainly be a profitable venture. Many good deals can be had on condos, or large homes, or small homes in foreclosure. But in reality, the best homes would be midsize, for a small family. That is the sweet spot for real estate, and the easiest to move. This is because a small family wants to buy a house more than someone looking at a condo or large place, they are a lot more motivated, and much more likely to go through with it. A bad house in a good neighborhood is much better than a good house in a bad neighborhood. That is the nice think about fixing up and flipping a house, is the house can be cleaned up, and even added on to. Yards, fences, new paint, even putting in a porch can be done to maximize value. In a run-down area, it is much harder to attract serious buyers even if the house is pristine. When renovating a house, a flipper wants to get the most money dollar for dollar. Though a nice pool or expensive granite top may look nice, this should not be a priority. Instead, focus on things that are universally liked, such as having a nice manicured front and back yard, and having everything function. The money is almost never recouped in putting money into luxurious upgrades. One of the best ways to spend money on a house that is going to be flipped is making the kitchen nice. Just functioning with a decent layout. Before buying, get as much information on the house as possible, noting any serious damages or problems. It can sometimes be difficult to get the full picture on a foreclosed home. But the more information the better, this can help save headaches and huge issues down the road. The thing with flipping is the buyer should look at the worst case scenario when buying. That is to say if the house does not sell, can the owner rent it out while the market improves. Many people who flip homes get stuck in this position, and ironically, the home can be foreclosed on. It would be a good idea to have enough cash saved up to pay the mortgage for six months, or even more. Any neighborhood in a good school district should do well. Even if the house is not so nice, many people seek out a neighborhood with excellent schools. Just buying a foreclosed home and bringing up to livable standards should be enough to make a profit. Be sure to do your research and see how much it’ll cost to invest in quality insurance for your new property. In some areas, the rates might not make the leap of faith worth it! Obviously, you need to find the right balance between risk and security here, and when insurance comes into play, it’s very multi-faceted. 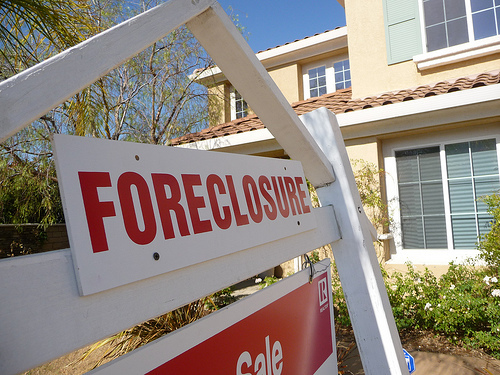 Flipping foreclosed houses can be extremely profitable and rewarding. But it does have its pitfalls, it is best to do as much research as possible. The buyer should certainly have enough money on hand, or loans, to make all the necessary upgrades and repairs. When done right, it will almost certainly be highly profitable. Jessie Favreau writes about real estate, finance and business. His recent work is about how to earn an online masters in finance.